“Every inch of the existence of mankind, from birth to death, is a bargain across a bargain,” said eminent author Charles Dickens in his novel Hard Times set in the Victorian era. The recent rally on Capitol Hill by a sizeable gathering of Indian-origin teenagers and young adults, whose future is at the mercy of the Trump administration’s immigration policy, reminded us of Charles Dickens’ timeless words. Caught up in the turbulent US immigration system, the children of legal immigrants from India raised a voice in a bid to protect their rights for the first time. Referred to as ‘DALCA Kids’ (Deferred Action for Legal Childhood Arrivals), they are on the verge of deportation from the United States even though their parents who came to the US legally are employed on legal work visas. Backed by powerful Republican lawmakers and Senator Rand Paul of Kentucky, the Indian American parents of DALCA Kids are desperately seeking an end to the impasse which is looming larger against their children’s future in America once the latter are 21 years old. As per the USCIS estimates, there are approximately 200,000 Indian American children among the DALCA Kids, who came to the US legally along with their parents on H1B and other work visas. So poignant is the desperation among the DALCA Kids of Indian origin and their parents in the greencard backlog, especially those who are about to turn 21 in the near future, that Vikram Aditya Kumar, one of the rally organizers, said that the Indian American community could help build the ‘Trump Wall’ along the Mexico border by raising $25 billion over the next decade. Vikram Aditya Kumar’s father, Shalabh Kumar is a Chicago-based industrialist and a steadfast supporter of President Donald Trump. Mr. Salabh Kumar made headlines for his one million dollar contribution to the Trump campaign in the US elections 2016. 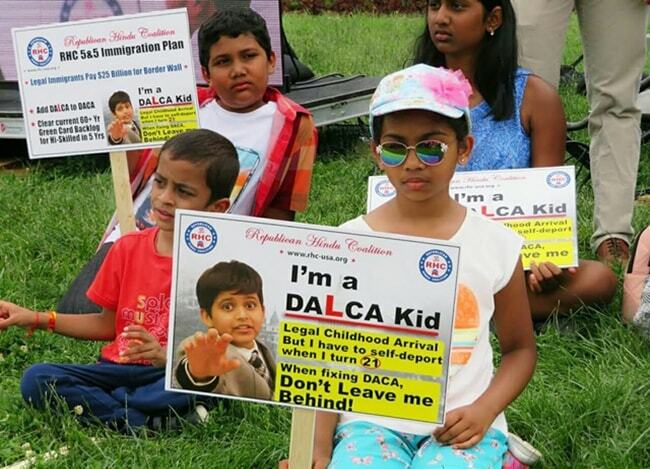 The DALCA Kids, most of who are in STEM, deserve the same attention as that to the children in the ambit of DACA (a federal policy for the undocumented young immigrants who were brought to USA as minors), according to Vikram Aditya Kumar and his sister Manasvi Kumar, who spearheaded the rally at Capitol Hill on June 15. Reportedly, there are 7000 Indians among the DACA children in the US. The offer to help President Trump build the Mexico border wall seems a bait to fetch attention from all quarters to the plight of DALCA youngsters in Indian American communities and their collective potential for future innovation in America. Being brought up and schooled in the US, they might face adjustability issues in a different socio-cultural and socio-political milieu of India. Besides, the proposed deportation of DALCA kids would cause a severe brain drain to the United States. Reducing the green card backlog and eliminating the per country cap for allotment of employment-based visas are the only solutions to the current fiasco in the US. But all the fuss about green card backlog and Trump’s ‘zero tolerance’ policy does not seem to end. Given the current rate of green card issuance, it will take Indian immigrants 151 years to get green cards, according to Cato Institute, a libertarian think tank. Travel Beats is an Indian American Community Portal by Indian Eagle, a leading travel booking partner of Indians in USA. Subscribe to Travel Beats’ free newsletter for the latest US immigration and visa news, Indian community news, inspiring stories and US-India travel updates.